Last Thursday I was flipping through the newspaper when I came across this interesting little review about a quirky Belgian stop motion animation feature named “A Town Called Panic”. Being someone who enjoys the odd, obscured animation film, I decided to check it out. 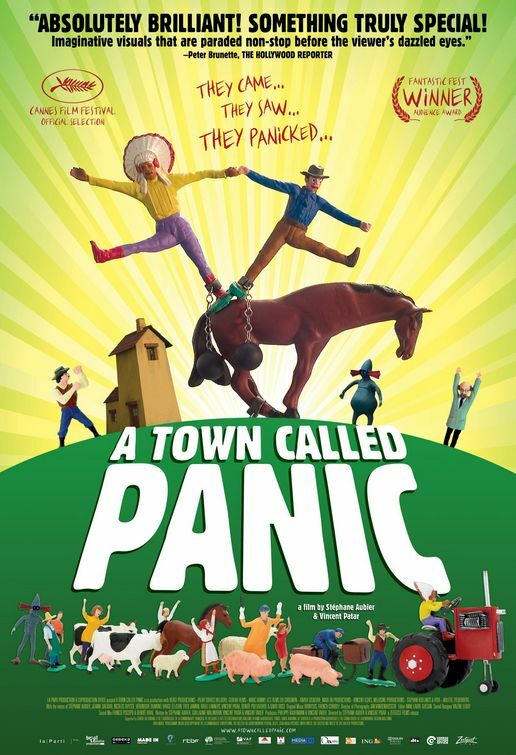 “A Town Called Panic” contains a lot of elements that I liked: Monty Python-type humor along with Charlie Chaplin/Buster Keaton-style of slap stick adventure. And there is just something about talking plastic figurines – French speaking no less – that fascinates me. I can’t explain it but if I were to guess, it’s probably the kid in me. The world of “A Town Called Panic” may look a bit simple on the surface but it’s full of neat subtleties and nuggets of humor that jump out at you when you least expected. That is probably what I enjoyed most about the film. As someone who has a profound disdain for plot spoilers, I will only say the three “heros” of the film embarked on a wild and whacky journey as a result of a silly mistake made by two of them. I’ll leave the rest for you to discover. “A Town Called Panic” is definitely a niche film so if you don’t care for silly, foreign-language-speaking plastic figurines roaming around in a surreal, bizarro world, it’s probably a good idea to stay away. Otherwise, I would highly recommend it to anyone looking for some good old fashion humor and silly slap stick “performed” by a hoard of cheap looking plastic figurines that will charm you in ways never imagined.